If you’re a fan of the easier, no-bake variety, then you’re going to enjoy this divine selection of cheesecakes to choose from. Chocolate biscuit base topped with a creamy caramel cheesecake and decorated with whipped cream, drizzles of caramel and chopped Snickers. A decadent and delicious no-bake cheesecake! Today I’m sharing a new favourite cheesecake recipe. You might have already guessed by now that I really love cheesecake? 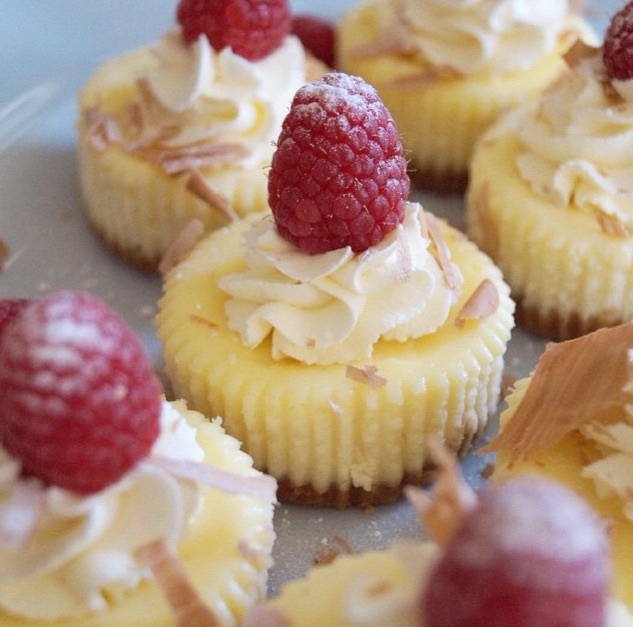 For dessert ideas my blog is majority cheesecake recipes, but there is always room for more. So when I don’t have much time on hand to cook or don’t feel like baking I always stick to my trusty no-bake recipes. No-bake cheesecake is always at the top of my list and seeing as Snickers are one of my favourite chocolate bars I thought I would experiment by adding them to my next cheesecake. I mean what’s not to like about chewy caramel, nougat and peanuts all encased in chocolate? This scrumptious dessert starts with a buttery chocolate sandwich biscuit base. Once you’ve crushed the biscuits/cookies to a fine crumb, you’ll mix with melted butter until the crumbs are moistened. Press this mixture into a springform cheesecake tin until it’s nice and compact, then pop that into the fridge and leave it be whilst you get on with preparing the next layer of the cheesecake. The caramel cheesecake is really simple to prepare and as we’re not adding any gelatine it’s really important you follow the recipe method closely to make sure the filling sets correctly. Please note this is a no-bake cheesecake and the texture will be closer to a mousse compared to a baked cheesecake, which sets as its bakes and as it cools it sets for even longer in the fridge. No-bake cheesecake sets only the fridge, so it is preferable to allow it to set for at a full 24 hours before serving. It will become firmer the longer it’s chilled. Once the caramel cheesecake filling is ready, spread it out onto the biscuit/cookie base you made earlier on. For the “Snickers” part of this recipe, there are two options: you can add the chopped Snickers to the cheesecake filling or you can reserve them to decorate the cheesecake with. Once your patience has been well and truly tested you can unravel this cheesecake delight. If I’m serving this for a dinner party I like to decorate with whipped cream, some of the leftover caramel from the tin and chopped Snickers. If you love caramel/dulce de leche, but aren’t a fan of Snickers then you might like to try out a twist on this original recipe. 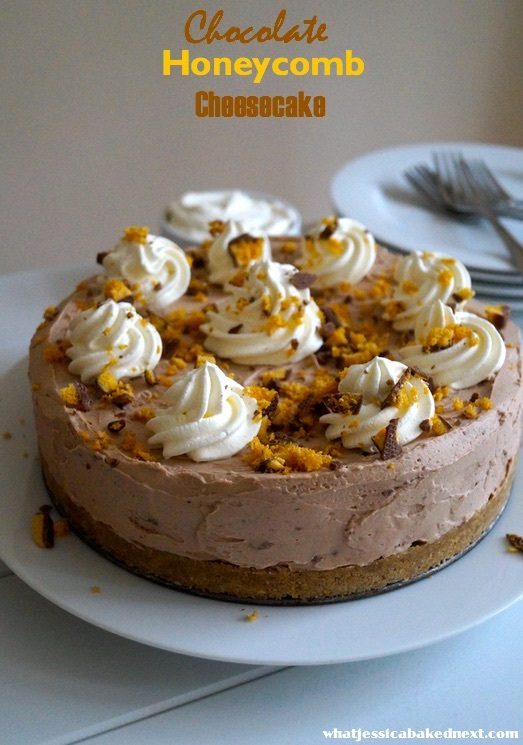 I recently made this cheesecake recipe again and left out the Snickers and I also swapped the chocolate sandwich biscuit/cookie base for shortbread biscuits and upped the quantity of butter in the cheesecake base to 140g. I then garnished each slice with extra caramel and decorated with Cake Angels Zillionaire sprinkles. Delicious and fun! To make the biscuit base: Crush the biscuits in a food processor or in a ziplock bag with a rolling pin until they’re fine crumbs. Add the melted butter and mix until all the biscuit crumbs are moistened. Press the biscuit crumb mixture into a 23cm/9-inch springform tin until compact and firm. Chill in the fridge whilst you make the cheesecake filling. To make the cheesecake filling: Beat the softened cream cheese with the caramel until smooth. Add a pinch of salt, taste and add more if you want. In a separate mixing bowl, whisk the chilled cream with the sifted icing sugar until stiff peaks form. Add the sweetened whipped cream to the caramel cream cheese mixture and continue to whisk for about 30 seconds until the mixture is stiff, don’t over beat the mixture otherwise it might split. Note: The mixture will be ready when it holds stiff peaks. At this point add the chopped Snickers if you want the chocolate to be in the cheesecake filling, otherwise reserve the Snickers for later when you’re ready to decorate the cheesecake. Evenly spread the cheesecake filling over the biscuit base. Smooth the top with a back of a spoon or a palette knife. Cover and leave to set in the fridge for 24 hours. Once set, remove from the tin and decorate as desired. 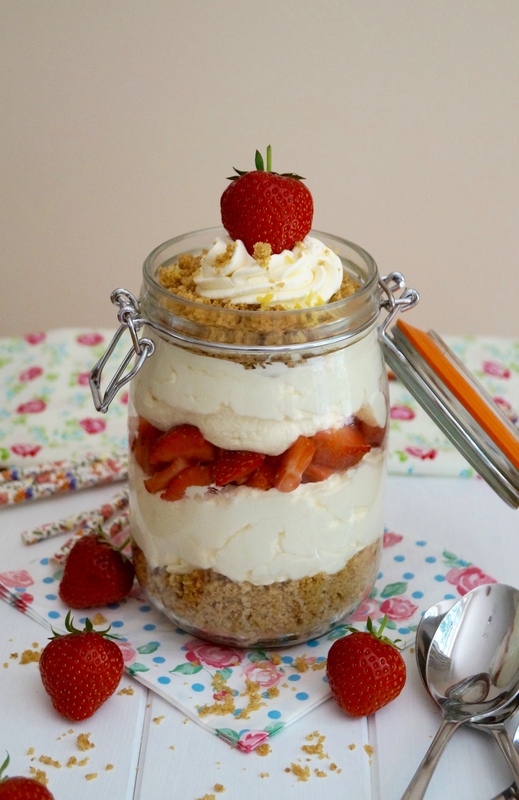 Strawberry Lemon Cheesecake in a jar! Layers of buttery biscuit crumble, creamy lemon vanilla cheesecake filling, strawberries and cream. The perfect summer sharing dessert! I was invited along with 14 other bloggers to create a foodie concoction using the humble jam jar. The Jam J-Art Challenge is to make food look good in a jam jar! 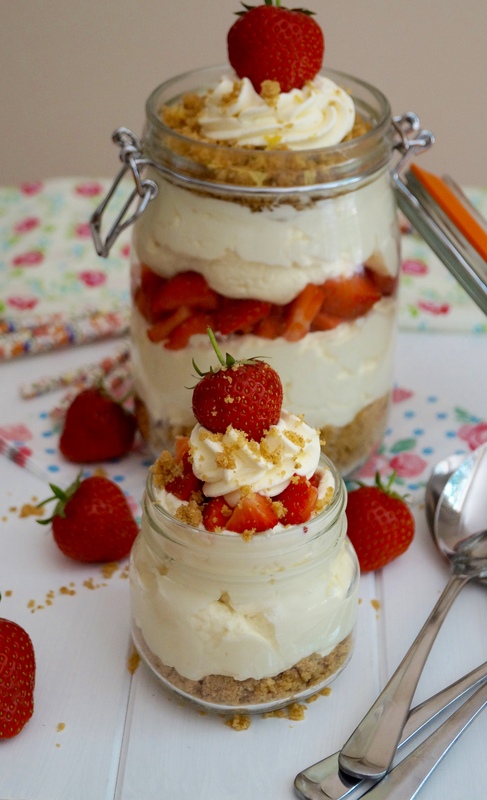 I love layered desserts and one of my favourite recipes in a jar or glass is cheesecake. 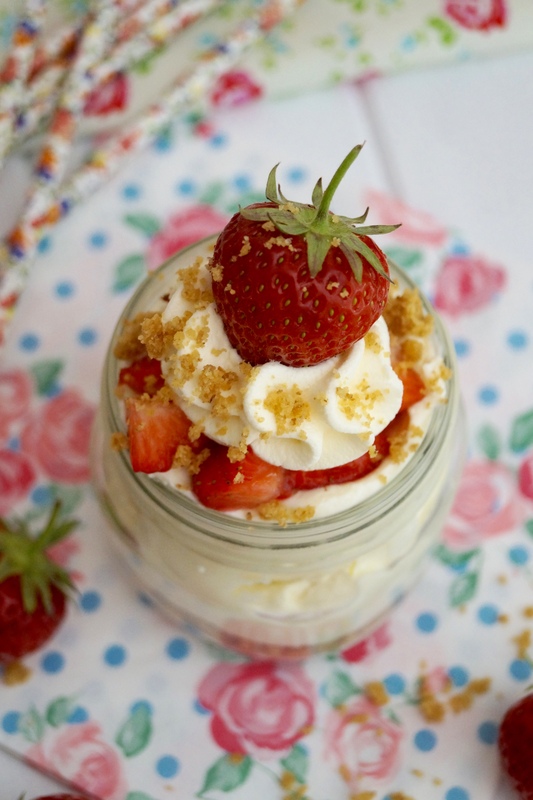 These Strawberry & Lemon Cheesecake in a Jar are my new favourite layered dessert! And as the strawberries are in season and at their best, I thought I would make a summer-style cheesecake. My cheesecake is layers of buttery biscuit crumble, creamy lemon vanilla cheesecake filling, a small layer of chopped strawberries, whipped cream and strawberries. The dessert itself is light, fresh and one of my favourite summer recipes to date. I’m new to layered desserts, I’m not the best at decorating these kind of desserts, so this challenge was great for me! These pots are great for sharing (but I don’t usually like doing that when there’s cheesecake involved!). It’s new favourite way to serve homemade cheesecake and I will definitely be making these throughout the summer! I made a few cheesecakes in smaller jars with some of the leftover cheesecake mix. To be honest, the recipe as well as filling one large jar (as pictured), will fill a few extra smallish jars too! This dessert links in with this great campaign about desserts that have inspired our sweet treats today – ‘Desserts Through the Decades’. The campaign consists of an infographic and accompanying article, tracing the desserts that were once all the rage, both conventional and bizarre, from the 1910s to the present day. I think it’s a great campaign because you get to see all the different desserts, anything from the classic Victoria sponge cake, eton mess, to the cronut! You can click here to read more! 1. To make the biscuit crumble: Crush the biscuit pieces in a food processor or a ziplock bag with a rolling pin until fine. Mix through the butter. Set aside, whilst you make the filling. 2. To make the cheesecake filling: Mix the cream cheese, icing sugar, vanilla, lemon zest and juice in a bowl. Whip the cream and then fold into the cream cheese mix. 3. To layer the cheesecake: Take approx. half the biscuit crumbs and sprinkle in the bottom of the jar. Follow by a layer of the cheesecake mix. Then top with the chopped strawberries. Top with another layer of cheesecake mix. Then scatter over some extra biscuit crumbs. Top with whipped cream and a strawberry for decoration. 4. Store in the refrigerator until ready to serve! Enjoy the recipe everyone! I hope this dessert inspires you to make and invent your own cheesecake in a jar creations! 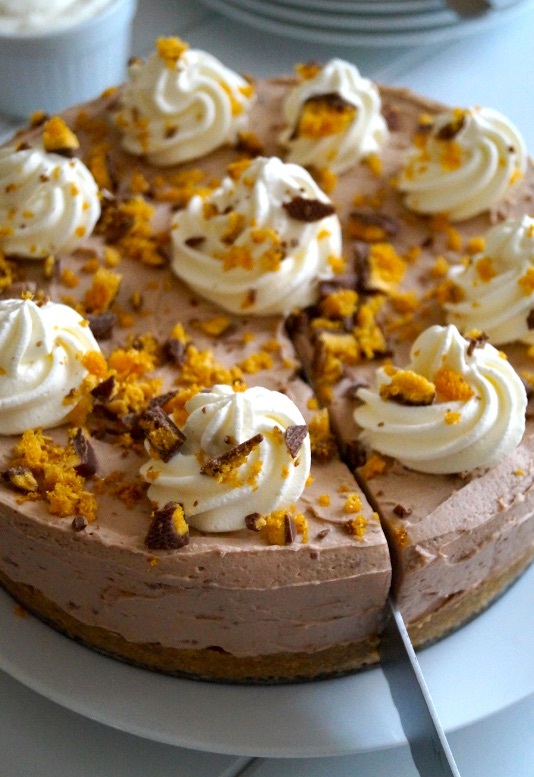 Milk chocolate cheesecake studded with crushed chocolate coated honeycomb pieces. 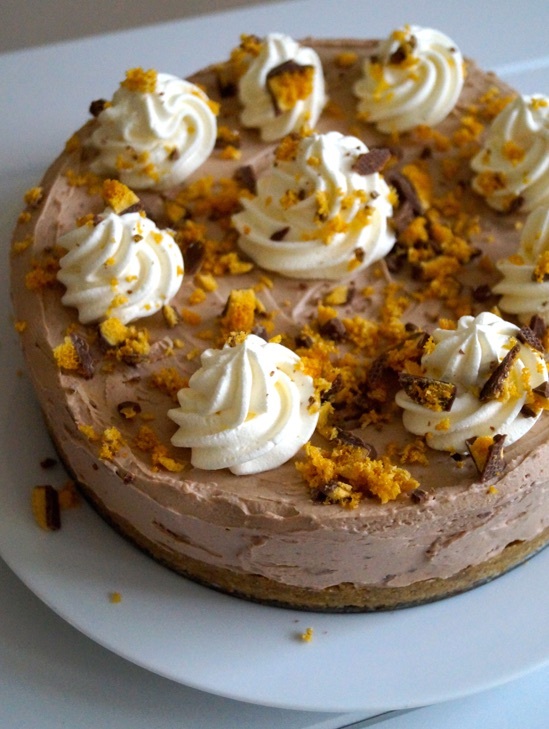 The best no-bake honeycomb cheesecake recipe you will ever try! This is actually a recipe-redo from a little while back. I posted a honeycomb cheesecake and have finally got some new photos for the recipe and made a few changes to the original. It’s been requested through emails from many readers and I finally got round to making one and I’m really happy to share it again! 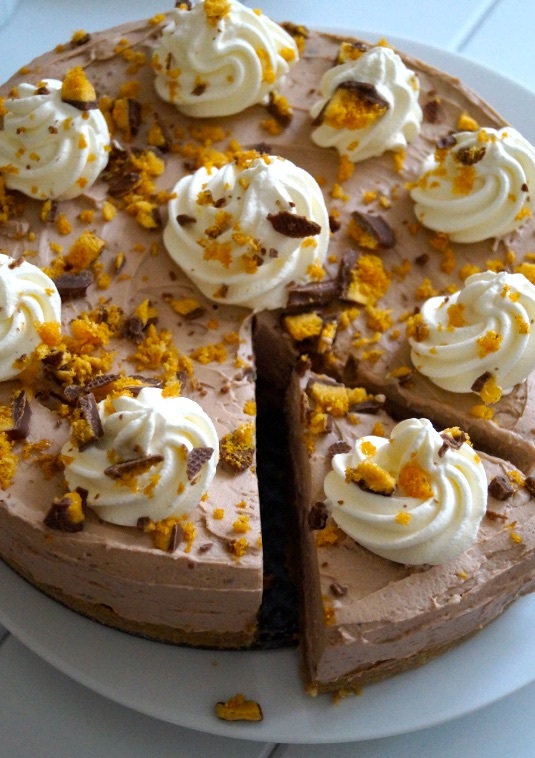 This cheesecake has to one of my favourites to date. 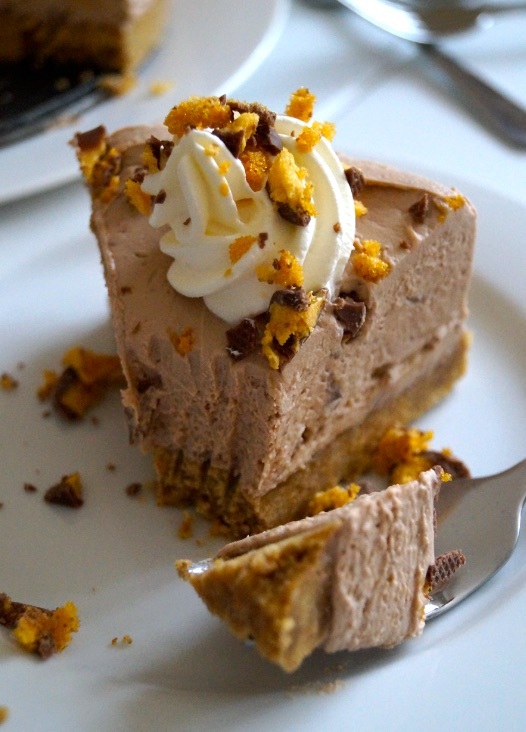 Chocolate coated honeycomb is one of the best type of chocolate bars and when combined with this easy, fluffy milk chocolate cheesecake it makes a delicious showstopper dessert. 1. To make the biscuit base: Crush the biscuits in a food processor of simply in a ziplock bag with a rolling pin until they’re fine crumbs. Tip into a mixing bowl and add mix through the melted butter. Press into a 23cm springform cheesecake tin until compact. Place in the fridge to chill whilst you make the filling. 2. To make the cheesecake filling: Beat the softened cream cheese with the icing sugar in an electric mixer until smooth and fluffy – this will take approx. 2-3 minutes. Then fold in the cream and chocolate. When well mixed through, finish by folding through the crushed honeycomb. Spread out onto the prepared base and even over with a palette knife or spatula. Now cover and leave to set in the fridge for at least 6 hours or overnight. * I recommend overnight chilling, as the cheesecake flavour develops and cuts more easily too. 3. To decorate: Take the cheesecake out from the fridge and allow to come up to room temperature for just 5 minutes before removing from the tin. Once removed, finish by drizzling over some extra melted chocolate, pipe on some swirls of whipped cream and then scatter over even more honeycomb. Note: The cheesecake will stay in the fridge for up to 3 days. Top with the cream and honeycomb just prior to serving. Looking for a fancy, yet easy to make and delicious Valentine’s Day gift? I have the recipe for you today! 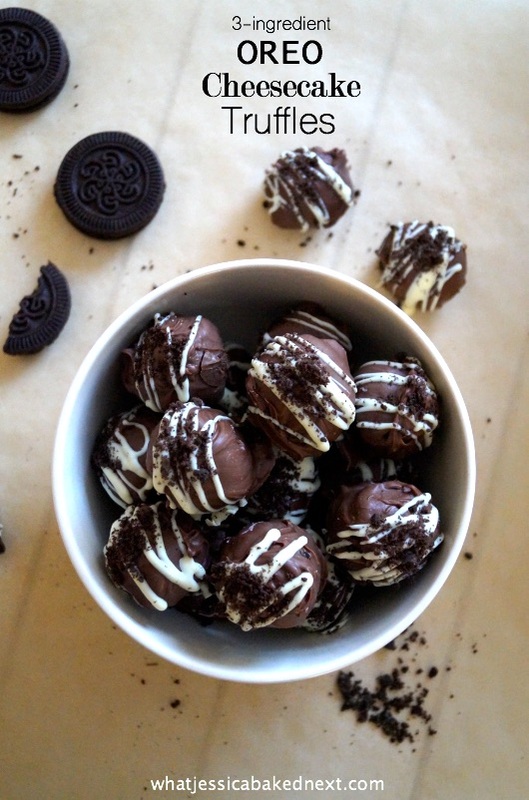 Cheesecake + Oreos + Truffles = total bliss. 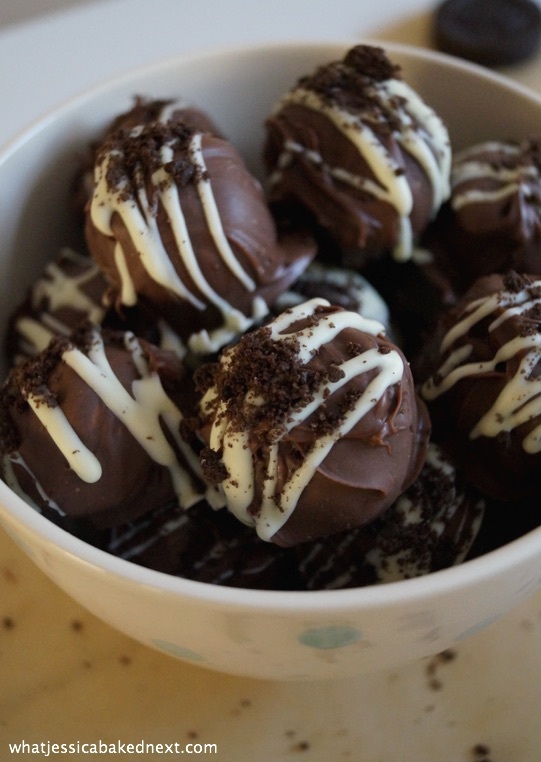 With only 3 INGREDIENTS, these Oreo Cheesecake Truffles would be great to make for your other half and they are perfect for literally any occasion! 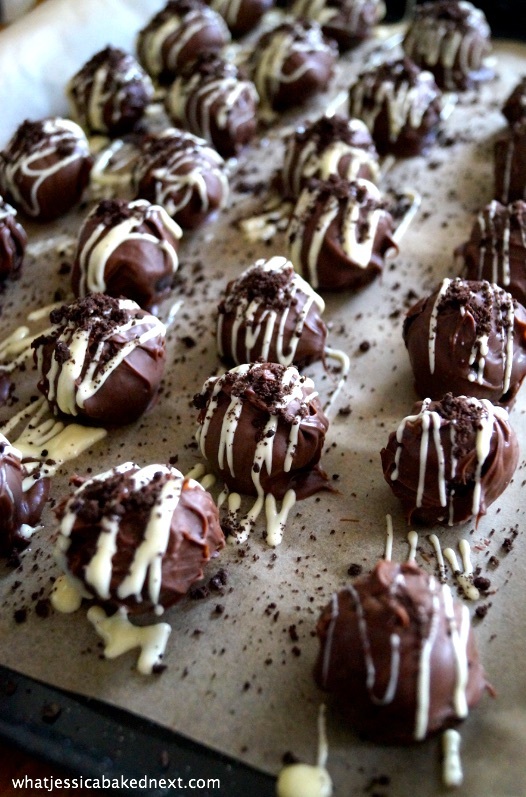 Crazy tasty AND quick to make – take these truffles to the next level by drizzling over melted white chocolate and sprinkling Oreo crumbs. Kids will LOVE making them and they will be a big hit with all the family! I think you all know by now how much I love cheesecake? Oreo cheesecake is definitely one of my most favourite/top cheesecakes. I love anything cookies ‘n’ cream – I’m just a little bit addicted…But I’ve been wanting (and seriously craving!) to make these cheesecake truffles for so long now – they’ve always look amazing and fabulously delicious. So when I took my first bite I was transported to chocolate Oreo cheesecake h.e.a.v.e.n. 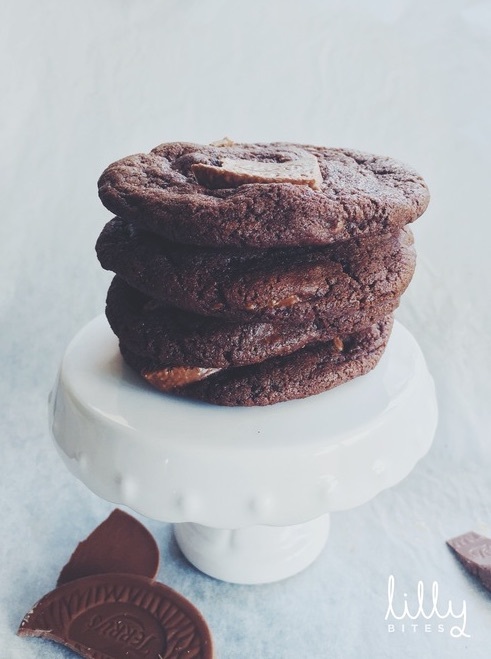 They’re insanely good (and pretty damn addictive too…). I had to restrain myself from eating the entire tray! This recipe will become your new go-to truffles recipe – for me regular truffles are way too rich! Why waste your time and effort on making regular truffles when you can make this INCREDIBLE recipe! They will become your guilty pleasure just like they’ve become mine! 1. First reserve 9 cookies for sprinkling later and set aside. Crush the remaining Oreos until a fine breadcrumb texture. Then tip into a medium-sized bowl along with the cream cheese. Mix with a spatula until it’s incorporated and almost “clumps” together. 2. Roll into roughly 30 balls, and place on a lined baking tray. Leave to harden in the refrigerator or freezer for 30 minutes until firm – it’s really important that they’re firm as if they’ve not the balls will fall apart in the chocolate! 3. Melt the chocolate/candy melts and coat each cheesecake truffle evenly – I like to use a fork to do this. Make sure you also shake off any excess chocolate. Place the truffle back on the baking tray and put back in the fridge for another 30 minutes to set. Serve now and enjoy! I Like to finish by decorating with a drizzle of melted white chocolate and some extra Oreo crumbs! You can also scatter over any of your favourite sprinkles too! Store in an airtight container for up to 2 weeks. Enjoy & Happy Weekend everyone! When I found this amazing recipe on one of my favourite food blogs I couldn’t wait to give it a go! They were absolutely delicious little bites of creamy cheesecake bliss. These cheesecake cupcakes are a few bites of total deliciousness and complete and utter dessert heaven for any cheesecake lover like me. You won’t believe how easy this recipe was, plus how quick they are to make! Pretty, delicious and simple recipes are always the way to my heart! These cute cheesecakes didn’t hang around for long and my taste testers requested trying one just a few hours into chilling. And even before all the swirling of cream and toppings they got the big thumbs up, which is always the sweet sign of success! 1. Preheat your oven to 170°C/ 150 Fan/ 325°F/ Gas Mark 3. 2. Mix together the biscuit crumbs with the melted butter until well combined. Press the biscuit crumbs into the muffin cases. Bake for 5 minutes just to toast slightly. Once cooked, take out of the oven and leave to cool in tin. Line a 12-hole muffin/cupcake tin with 12 paper liners. 3. Whilst the biscuit bases are cooling make the filling. In a stand mixer fitted with a paddle attachment or alternatively a large mixing bowl with an electric mixer beat the cream cheese for to soften. Then gradually add the sugar and once it’s all added continue to mix for another minute. Add the eggs and vanilla and mix through – at this point make sure you scrap down the sides of your mixer to ensure the batter and ingredients are all well incorporated. 4. Spoon about 3 tablespoons of the cheesecake mixture into each prepared mini cheesecake base, making sure you fill 2/3 of the way up. 5. Bake for 22-24 minutes or until the centres are just set. Once set take out of the oven and leave to cool in the tin completely. Refrigerate for at least 4 hours or overnight. When ready to serve swirl with whipped cream and top with each cheesecake cupcake with a raspberry and some chocolate curls. 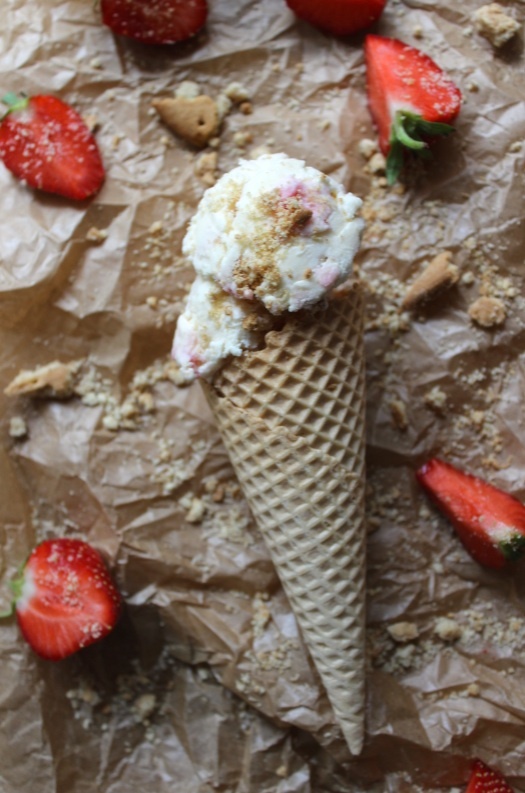 This no-churn, no-machine Strawberry Swirl Cheesecake Ice-Cream is super delicious and makes a great summer treat! Easy to make, and like most my ice-cream recipes this one is completely no-churn and only requires a handful of ingredients to make. I decided to post another ice cream recipe as my Melba Popsicles were really well received by you all, so thank you to everyone who left me some lovely comments- I really appreciate it! So, as my ice-cream recipes have been so popular with you all and lots of my readers have been asking me to share more strawberry recipes I knew more ice-cream was the perfect choice for today! Strawberry Cheesecake was my favourite flavour on to enjoy whilst I was on holiday last year, so I thought it would be great to make my own! I wasn’t disappointed, as this ice-cream was so, so good! 1. 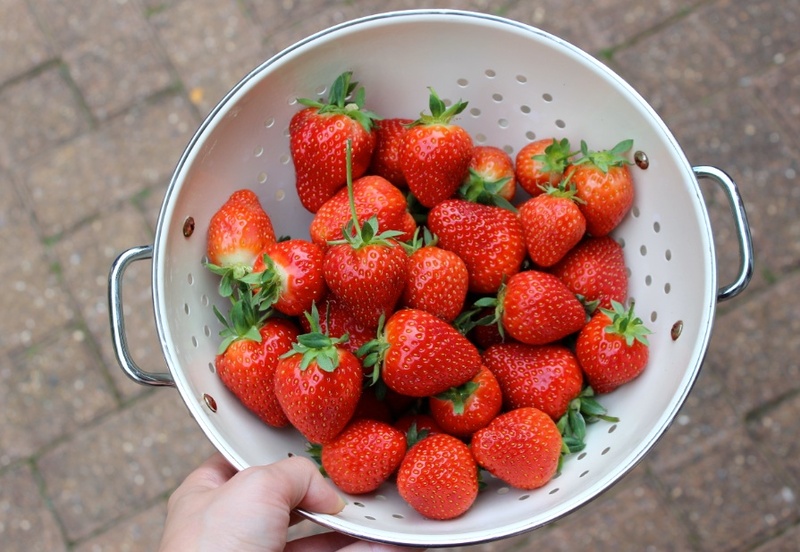 To make the strawberry syrup: Place the chopped strawberries, sugar and hot water in a small saucepan. Heat gently, allowing the sugar to completely dissolve (stir occasionally). When there’s no sugar granules left, bring the mixture up to the simmer. Simmer gently for 5 minutes. Then blitz in a food processor/blender until smooth. Pass through a sieve into a bowl to extract the seeds. Then cool down and place in the fridge until cold and slightly thickened. 2. To make the Ice-Cream base: Whisk the cream and vanilla until just starting to thicken. Add the really soft cream cheese and then whisk for just a few moments to combine until smooth. Fold in the condensed milk. 3. For the biscuit crumbles: Mix together the crushed biscuit and melted butter. 4. To assemble: Fold in half the biscuit into the ice-cream base with half the syrup. Swirl the syrup around a little to combine the flavour throughout. Then pour into a regular loaf tin. 5. Finish by sprinkling over the remaining biscuit crumbs and swirling in the strawberry syrup. Cover with cling film and then really carefully place in the freezer for at least 6 hours or overnight. To serve- Allow to thaw for 5 minutes, then scoop into waffle cones or into bowls. ENJOY! Enjoy and have a great weekend guys!